New Delhi, April 12: Chennai Super Kings captain Mahendra Singh Dhoni walking onto the field after a no-ball was called and then overturned in the 20th over of the CSK innings against Rajasthan Royals in Jaipur on Thursday created an uproar with all and sundry questioning the skipper's action. While the CSK captain was fined 50 per cent of his match fee, some have called it a lenient decision because he is Dhoni. But speaking to IANS, sources in the know of developments revealed that it was on the word of leg-umpire Bruce Oxenford that the match referee -- Prakash Bhatt -- decided to keep the sanction to just the deduction of match fee. 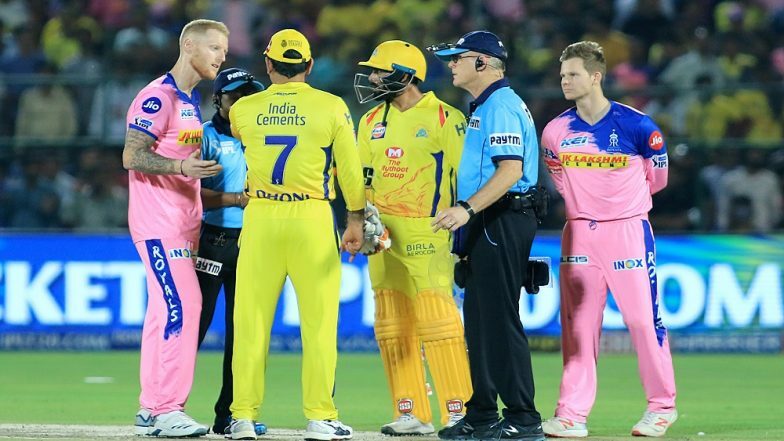 "When all parties met in the match referee's room after the game, Oxenford made it clear that he wasn't offended by the CSK skipper's act of walking onto the field and having a discussion on the no-ball being reversed," the source said. While the umpire might have understood that the reaction came at the heat of the moment, it didn't go down well with former cricketers who felt that it painted a really bad picture. 'Captain Cool' MS Dhoni Loses Cool in Final Over of CSK vs RR, Hits Out at Umpire for Retracting No Ball Call. "This is not a good look for the game... No place at all for a captain to storm onto the pitch from the dugout," former England captain Michael Vaughan tweeted. Former Australia opener Michael Slater, who was commentating in the match, was shocked by what he saw. "I can't say I've seen this (before)," Slater said. "You will never see a captain storm onto the field to have a discussion with the umpires. Unbelievable." Echoing Slater, former India wicketkeeper Deep Dasgupta said: "He's got every right to go and speak to the fourth umpire, he's got every right to speak to the match referee ... but walking in while the game is on (is wrong). Just because you feel you've been wronged, you can't go and do things which are not permitted." Former Australia pacer Shaun Tait also lashed out at Dhoni. "You don't walk onto the field. It's not village cricket or U-10 cricket -- this is the IPL. "You're a player. I think Dhoni sometimes forgets that he's a player. You're not an official, you're a player, and you can't control the officials. It was a really bizarre look," Tait said. While Dhoni has been criticised by the former players, this isn't the first howler that has come from the Indian umpires in this edition of the Indian Premier League. In the game between Royal Challengers Bangalore and Mumbai Indians on March 28, S. Ravi failed to call a no-ball off Lasith Malinga in the final over of the RCB innings. In the post-match ceremony, both RCB skipper Virat Kohli and his MI counterpart Rohit Sharma made their displeasures known.